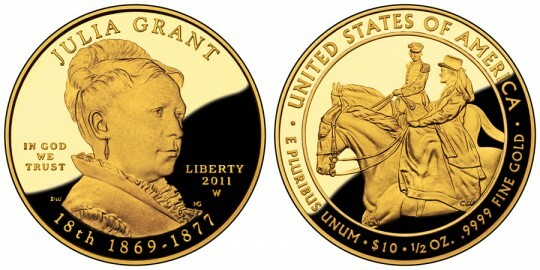 The Julia S. Grant First Spouse Gold Coin is the second of four strikes in the series to appear in 2011 from the US Mint. It also marks the nineteenth for the program overall which debuted in 2007 to honor the spouses of the former Presidents of the United States. Julia served in the White House along with her husband, Ulysses S. Grant who was the 18th President of the United States from March 4, 1869 until March 4, 1877. Service alongside her husband was nothing new for Julia who had joined him in the field many times as he rose to service and distinction during the American Civil War. After his election to the White House, Julia thrilled in the social duties required of her and called the time the "the happiest period" of her life. Together, the Grant's served two terms and left the office in 1877. There are actually two versions of this coin minted by the US Mint - the Julia S. Grant First Spouse Gold Proof Coin and the Julia S. Grant First Spouse Gold Uncirculated Coin. Both coins contain identical images, but feature different finishes. The obverse of the coin will contain a portrait of Julia Grant along with the inscriptions of "JULIA GRANT , " "IN GOD WE TRUST", "LIBERTY", "2011", "18th" and "1869-1877". The reverse will include the inscriptions of "UNITED STATES OF AMERICA", "E PLURIBUS UNUM", "$10", "1/2 OZ. ", and ".9999 PURE GOLD" along with a scene from the life of Julia.